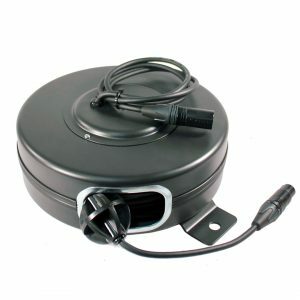 Stage Ninja 40 foot retractable female Genuine 5-pin Neutrik® DMX cable reel with 6 foot static male end and 9 inch black powder coated steel housing. 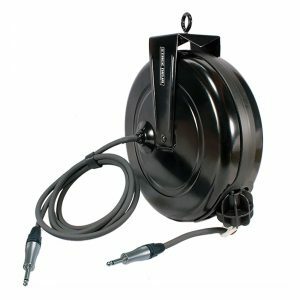 Stage Ninja 40 foot retractable speaker cable reel with 6 foot static end and genuine 2-pole Neutrik® SpeakOn connectors and 9 inch black powder coated steel housing. 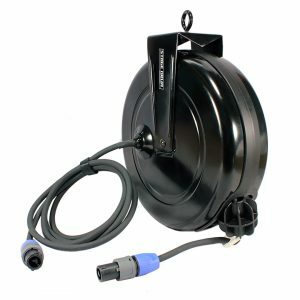 Stage Ninja 40 foot retractable speaker cable reel with 6 foot static end and genuine Neutrik® 1/4″ Jumbo connectors and 9 inch black powder coated steel housing. 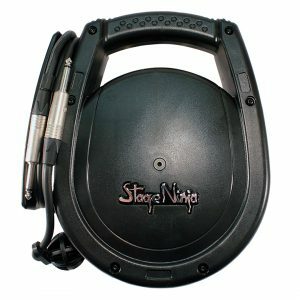 Stage Ninja 20 foot retractable instrument cable reel with 6 foot static end and 8.5 x 10.5 inch thermoplastic housing.